Why Is a stool sample required? Some parasites are very evident, with adult roundworm and tapeworm being very visible in stools. However, once they are observable with the naked human eye, then usually your dog or cat is experiencing advanced stages sickness. A stool sample will be able to analyze feces to check for worms as well as for disconnected segments. A stool sample is also required to discover eggs, which tend to be microscopic in size. Whipworms are parasites of dogs. Looking like small pieces of thread, whipworms tend to occupy your pet’s intestine. Whipworms do not lay many eggs, so several stool samples need to be examined to determine if whipworms are the potential culprit. Stool that is encased in mucus or extreme weight loss is usually attributed to whipworm infestation. Fortunately, whipworms hardly cause deaths. Roundworms tend to affect puppies and kittens, especially those living in close quarters. Puppies that come from puppy mills and pet shops tend to be inundated with this parasite. Roundworms tend to be very common due to the way it is spread. The roundworm larva can migrate between the mother and the developing fetus. It can also be spread during nursing time. Once the larva migrates, they grow up to 5 inches in the dogs or cats intestine. There they start to absorb nutrients from the intestinal tract, then it will start laying eggs. Roundworms can lay up to 1 million eggs over the span of a couple of weeks. Due to this number, many kittens and puppies with advanced stages of infestation tend to have large bellies and mid sections. Severe infestations can cause a blockage, killing the host. Not only are puppies and kittens in danger of roundworm infestation, but adults can be exposed as well. Hookworms are also much more common in dogs and puppies, but can also infect cats and kittens. Hookworms secure themselves to the small intestines, sucking up blood for nourishment. Exposure to hookworms occurs via stool that has been contaminated by it or ingesting the eggs by other means. Puppies and kittens can also be exposed to the parasite by nursing on an infected mother. Due to the loss of blood, advanced stages of hookworm infestation tend to cause anemia. Poor weight, loss of interest in favorite foods and treats and low energy are all hallmarks of a hookworm infestation. The key to a long canine and feline life is prevention. 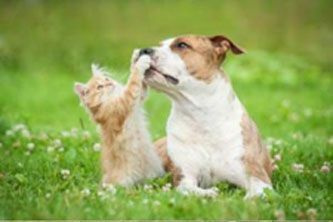 Make sure that your cat and dog visits a veterinarian on a regular basis. Most seemingly healthy pets can go with yearly visits. But dogs and outdoor cats should be examined at least twice a year. Dewormers can be given to you by your veterinarian. Keep your pets on year-round flea prevention to reduce your pet’s exposure to fleas that may have parasites clinging to the. It is recommended that you do not allow them to wonder in marshes and areas with tall grass. These tend to be breeding grounds for parasites, worms, and bacteria that can infect your pets. In many places, it is required by law that pets are vaccinated before they are able to go to dog parks and other places where dogs congregate. Even though most pet owners follow this rule, it is still important to be able to pinpoint symptoms. You do not want a sick dog to potentially expose your pets to illness. A dog that looks particularly lethargic, dirty, and looks like they have excessive bloating around the midsection; are all potential signs of a dog that is infected. For outdoor cats, consider converting them to indoor cats. Outdoor cats are exposed to the elements, predators, aggressive cats, and parasites. An outdoor cat generally lives a much shorter life than an indoor cat.